Just cross the street and you're on the beach! TOP spot! The condominium Residencial Maresias is located in a privileged location of the beach, being only a few meters from the sand. Family atmosphere, with 24 hour concierge and many recreational areas such as soccer, tennis and volleyball courts, swimming pool, sauna, gym, billiards, beautiful barbecue areas and others. Runway of cooper in front of the condominium. The condominium has a beautiful area with gardens with beautiful mountain views, it is in this area that guests enjoy the barbecue kiosks. The kiosk has a barbecue, sink, refrigerator, stove and tables, a fantastic place to gather family and friends. 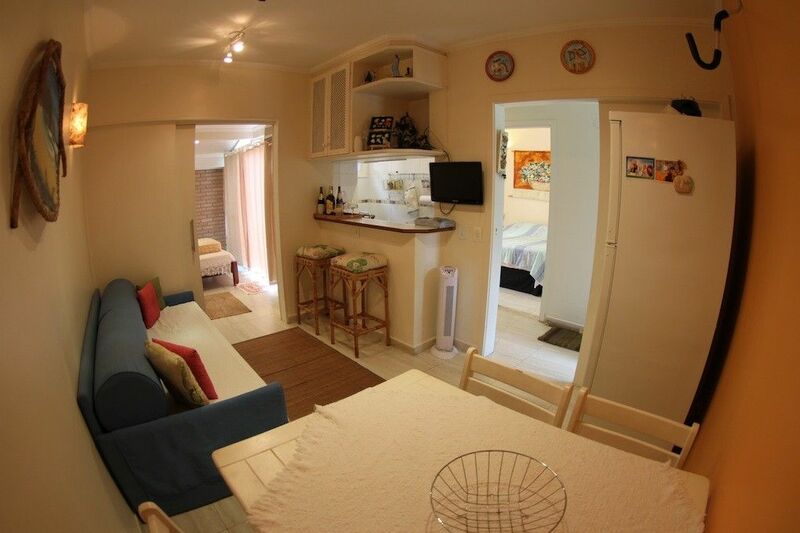 The property offers a very pleasant, cozy, modern and well equipped. Full kitchen with all the main appliances and appliances. Dry environment, no beach house smell, and great mattresses. It has WiFi internet and Sky TV. The property is ground floor, being very safe for children and elderly. The car is parked on the door of the property. Travesseio, bed and bath linen are NOT included. Fizemos uma ótima escolha. Tudo certo e bem próximo da praia. Fizemos uma ótima escolha, tudo funcionando perfeitamente, a casa estava super arrumada e limpa qdo chegamos. Éramos um casal e um cachorro que requer cuidados especiais e a proximidade da praia facilitou muito. E o Fábio é muito legal e descomplicado! Adoramos. Super tranquila a locação com a Alessandra. Tudo correu bem e o imóvel foi bem cuidado. Excelente acomodação... Estrutura completa, organização, limpeza, disponibilidade do anfitrião, localização, proximidade da praia/mar, serviços. Certamente retornaremos! O apartamento estava super limpo, atendeu e superou nossas expectativas! O proprietário super atencioso, e disposto! Imóvel bem localizado, condomínio com uma boa estrutura de lazer, muito limpo, pessoas simpáticas, lugar ideal para um bom descanso, além da atenção prestada pelo proprietário.Recomendo totalmente. Gostei muito a casa bem equipada. Ótimo, ambiente muito agradável e familiar. A casa tem um ambiente agradável e aconchegante para quem busca descanso com a família. Para acesso à praia de frente da casa é somente atravessar a rua mesmo, bem perto. O legal que você pode desfrutar da área da piscina e área de lazer do condomínio tranquilamente, o lugar é gostoso e agradável! O proprietário Fábio foi ótimo, nos orientou enquanto as praias e localidades próximos para melhor aproveito da cidade, fomos muito bem atendido durante a estadia na casa. Com certeza eu recomendo e retornarei outras vezes, foram 6 dias de descanso que aproveitamos muito bem. The condominium is located on the beach of Maresias, which is undoubtedly the most beautiful of the Paulista coast, much sought after by surfers because of its excellent waves and also by families looking for a beautiful beach with clear water sand and surrounded by mountains . Nearby you can find bakeries, pharmacies, markets, shops, great restaurants, bars, nightclub and others. Maresias is located in the southeast region of Brazil, is a neighborhood located in the municipality of São Sebastião, north coast of the state of São Paulo. The neighborhood is also known to be surrounded by the Atlantic Forest. It is just over 25 km from the center of São Sebastião. The beach of Maresias has a great tourist infrastructure, attracting several people throughout the year. The variety of leisure is incredible, there are several options for lodging, gastronomy. In the region you find ecotourism companies that offer boat trips to islands, trails, waterfalls, rappelling, surf lessons and more. Os valores informados são básicos de baixa temporada. Não considerar para feriados e alta temporada, para estes casos solicite o valor por email.